My son, Grayson, is dressed up as Jon Snow from Game of Thrones this past Halloween. My husband and I are avid fans of the show, Game of Thrones, and wanted to come up with a creative costume this year for Halloween. 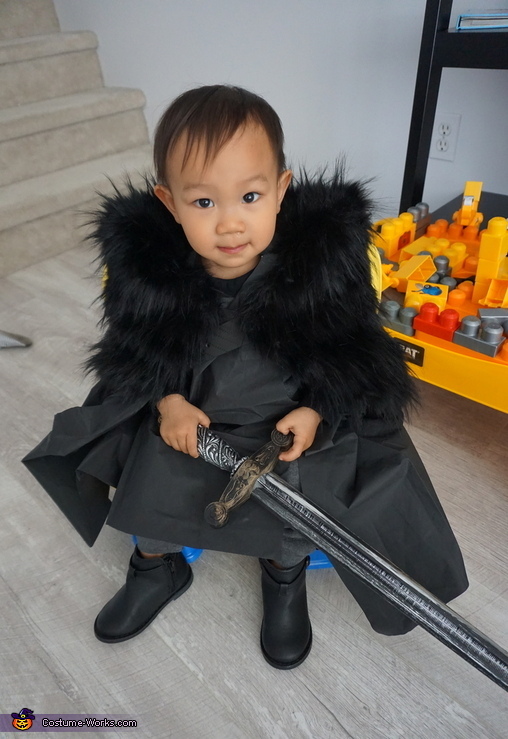 Jon Snow is one of the shows most popular characters and definitely one of our favourites, so we decided it would be incredibly cute to dress up boy as this character! For the cloak: I bought a kid-sized cape and an adult leather belt from Dollarama. I cut the cape short to fit my son's height. The cut out cape was tailored into an armor for my son to wear in the inside of the cloak. I cut the belt so it makes a criss-cross closure for the cloak. I also used the remainder of the belt to make a belt for the armor. For the fur: I attached my Forever 21 fur vest onto the cloak. Our little Jon Snow went trick-or-treating at the mall, parading around in his little "King of the North" outfit. Lots of other trick-or-treaters recognized his costume and thought "Mini" Jon Snow was the cutest thing ever -- and we couldn't agree more!